Mayor and deputy mayor candidates of Nepali Congress in Birgunj canvassing for votes at Sirsiya, Birgunj on Sunday. KATHMANDU, Sept 11: Elections in Province 2 have come as a litmus test for the Madhes-based parties amid shrinking space for fringe parties in the national political sphere. The Election Commission is holding polls in 136 local units in Province 2 on September 18. Unlike other provinces, there is no clear frontrunner in Province 2. It is rather going to be a multi-cornered battle among the national parties and the regional parties. Both the national and regional parties are leaving no stone unturned to secure a decent total in the third and final round of the civic polls. The desperation of the parties to win in Province 2 is understandable as it is the only way to hold sway on the political, social and economic spheres of one of the most populated and strategically important provinces. Madhes-based parties are especially under pressure to do better as they are taking the upcoming polls as “a prestige issue”. 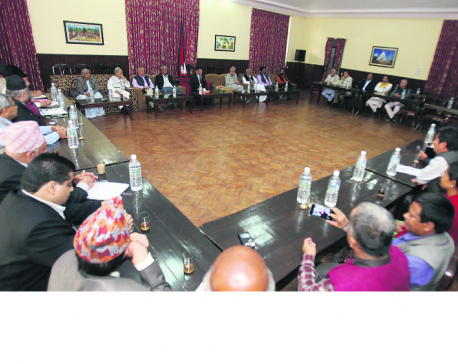 The parties, which are the key players in the region, consider Province 2 as their bastion. Many Madhesi leaders believe that the local poll is also attached to their political survival. “We are few months away from two important polls. Our performance in this poll will naturally affect our performance in the next polls. That’s the reason why all parties are looking for good results,” said Brishesh Chandra Lal, vice chairman of Rastriya Janata Party Nepal, an important regional player in Province 2. A weak show in the local polls, Madhesi leaders opined, will not only weaken their already weak voice in the national stage but also put them out of race in the planned provincial and parliamentary elections. The provincial and parliamentary polls are scheduled to be held in two phases on November 26 and December 7. Madhesi leaders said the regional parties are looking to fare better than they did in the first Constituent Assembly elections in 2008. During the first CA elections, the Madhesi Janaadhikar Forum Loktantrik, now Federal Socialist Forum Nepal, had won 54 seats, while the Tarai Madhes Loktantrik Party and Sadbhawana Party had respectively won 21 and 9 seats. On the surface level, Madhes-based parties are better positioned in Province 2. The parties, notably the Rastriya Janata Party Nepal and Federal Socialist Forum Nepal, were at the forefront of the protest against the constitution. The regional parties’ stance on the constitution resound well among the core Madhesi communities who constitute the majority of voters. Moreover, there is a deep anti-establishment feeling among a section of Madhesi youth. But the Madhesi parties are sure to face multiple challenges to repeat the electoral feat of the first CA. It remains unclear whether the immense goodwill bestowed by the locals upon the Madhesi parties will necessarily translate into electoral success. Despite their unclear stance on the constitution, parties like Nepali Congress, CPN-UML and CPN (Maoist Center) enjoy considerable support in Province 2. The big three have comparatively better organizations and cadre base than the regional parties. Madhesi leaders said that the local polls have come as both challenge and opportunity for the regional parties. “Clear agenda and ideology is the most important factor to win the elections. But multiple other factors including candidate selection, the internal dynamics of the individual constituency and the campaign affect the poll outcomes,” said FSFN Chair Upendra Yadav. In addition, the parties’ ongoing aid and relief works to help victims of the recent floods is also likely to affect the poll outcomes. All parties have been quietly reaching out to the flood victims in order to canvass support during the upcoming polls.